Russia has defended plans to keep its forces in the key Georgian port of Poti, saying it does not break terms of a French-brokered ceasefire deal. The US, France and UK say Russia has already failed to comply by creating buffer zones around the breakaway regions of South Ossetia and Abkhazia. Russia's Gen Anatoly Nogovitsyn said combat troops had now left Georgia and only peacekeepers remained. Georgia accuses Moscow of creating an economic stranglehold on the country. Georgian forces are reported to be back in control of the main east-west highway and residents are returning to their homes in Gori, the largest town close to the border with South Ossetia. For the first time in more than two weeks the main road from the capital, Tbilisi, to Gori is packed with traffic, reports the BBC's Gabriel Gatehouse. Minivans are taking passengers back to the towns they left, and carrying provisions to villages where very little has got through the conflict began. But this is still a fluid situation, our correspondent reports. The Russian checkpoints along this road may have gone but Russian forces still share the road with Georgian soldiers in their green pick-up trucks. Earlier, about 1,000 Georgians held a demonstration just outside Poti against the Russian continued presence, the Associated Press reports. There are also reports of protesters marching on Russian positions outside Gori. French President Nicolas Sarkozy, who brokered the peace plan, has called on Russian President Dmitry Medvedev to withdraw Russian forces from the road linking Poti and Senaki, scene of Georgia's main airbase. Mr Sarkozy's office says he spoke to Mr Medvedev by telephone. 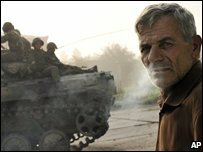 Earlier, Gen Nogovitsyn, who said Russia was not the Soviet Union or the Evil Empire, accused Georgia of preparing acts of sabotage in South Ossetia and preparing troops for "further actions". He also warned that should the US start rearming the Georgian army, Russia might enlarge its peacekeeping force. 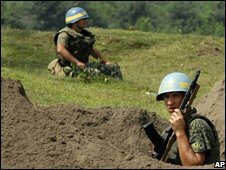 Moscow intends to maintain what it describes as a peacekeeping presence of 2,600 troops in "buffer zones" around Abkhazia and South Ossetia. Russia insists it is allowed these zones under previous peacekeeping agreements that ended fighting in Abkhazia and South Ossetia when they first broke away from Tbilisi in the 1990s. The zones include sections of the main highway from Tbilisi to the Black Sea as well as the airbase at Senaki. Gen Nogovitsyn admitted that Poti, 32km (20 miles) south of Abkhazia, was outside this zone. The general accused Nato of increasing tensions by massing forces in the Black Sea. He said the arrival of Spanish, German, US and Polish ships in the Black Sea "did not contribute to the settlement of the situation". Nato says it is holding long-planned exercises in the area, which were not linked to the conflict in Georgia. Under the terms of the six-point peace plan, Russia must not jeopardise freedom of movement in Georgia, says the BBC's Humphrey Hawksley in Moscow. Gen Nogovitsyn said the Russian force was in full compliance with the principles signed by the French and Russian presidents. "The first of them is not using force," he said. "The second one is the end of all military actions. The Commander in Chief of the Russian Federation has taken a decision to that effect and all military activities have been stopped. "Only peacekeeping actions are still being executed by a special contingent." France brokered the ceasefire to end fighting over Georgia's Russian-backed breakaway province of South Ossetia which started on 7 August. The deal's terms are vague about the extent of any buffer zones, analysts say. A spokesman for the French foreign ministry, Eric Chevalier, said a United Nations Security Council resolution was needed to clarify exactly what the ceasefire agreement covers. The UN Security Council was split this week over a resolution, with rival drafts submitted by Moscow, and the US and its allies.